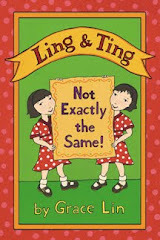 LING & TING are coming! Celebrate WHERE THE MOUNTAIN MEETS THE MOON! Party Contest: Enter for a Gift Certificate! Which cupcake did you get? What is your SECRET to happiness? Which "Where the Mountain Meets the Moon" character are YOU? What Chinese Symbol of Fortune do YOU need? In the valley of Fruitless mountain, a young girl named Minli lives in a ramshackle hut with her parents. In the evenings, her father regales her with old folktales of the Jade Dragon and the Old Man of the Moon, who knows the answers to all of life's questions. 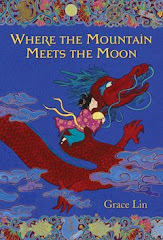 Inspired by these stories, Minli sets off on an extraordinary journey to find the Old Man of the Moon to ask him how she can change her family's fortune. She encounters an assorted cast of characters and magical creatures along the way, including a dragon who accompanies her on her quest for the ultimate answer.